Pedi QuikCalc is the fastest, most up-to-date medical calculator for pediatrics, giving you instant access to weight-based drug dosing, IV fluid rates, and weight conversions. Pedi QuikCalc contains only the information you actually need every day, so you can find it fast. I can’t tell you the last time I needed to calculate the A-a gradient! 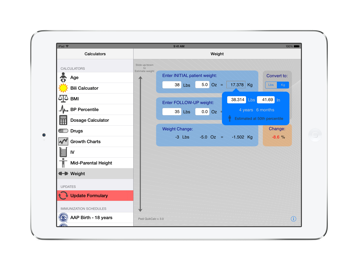 Additional calculators like an Estimator for weight- and length-for-age, Growth Charts, Bilirubin evaluation, BMI-for-age, Adjusted Mid-Parental Height, and a flexible Dosage Calculator expand on these core functions. Pedi QuikCalc is frequently updated to bring you the most current pediatric medical information and best features! Speed nursery rounds, quickly calculating the percent weight loss from birth weight, and then finding where the bilirubin results fall on the nomogram! Simplify calculating the percent dehydration from the patient’s weight loss, and find the IV fluid bolus volume and IV rates for proper, staged rehydration. Use the NICU baby’s discharge weight in grams to calculate the weight gain on your scales in pounds and ounces! •Innovative data entry and automation display results quickly and clearly WITH LESS TAPPING! •Enhanced drug search functionality allows searching all drugs by trade or generic name OR by pharmaceutical category (like "Cephalosporin," "Corticosteroid," "Histamine Antagonist," or "CNS Stimulant")! A really fast way to find specific drugs, or a group of related drugs! •Pain management drug dosing, searchable by categories like "Analgesic," or "Opioid"! (Includes Codeine, Demerol®, Dilaudid® IV, PO and PCA, fentanyl, hydrocodone/acetaminophen, morphine, morphine PCA, oxycodone, Percocet®, Vicodin®). •Additional calculators and access to useful web links expand core features! 1 Suggested dosing provided as an educational aid and not as a substitute for or an override of professional judgement.